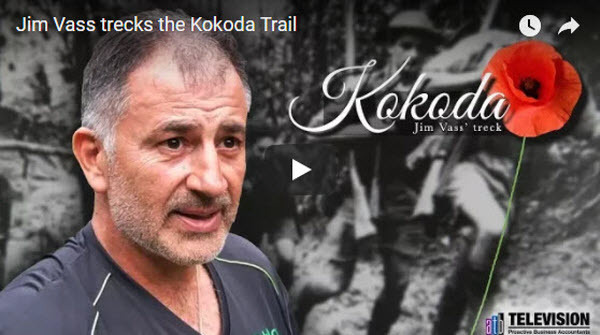 In September 2017, ATB Director Jim Vass trekked the Kokoda Trail. As part of the “Wish You Were Here” team, Jim set off to raise awareness and funds for Pancreatic Cancer, a cause close to his heart. Supported by his family, friends, ATB Chartered Accountants and their clients and business partners, Jim and the team have helped make a huge difference. With a friend battling Pancreatic Cancer, Jim realised there had been limited advancement in finding a cure for the disease and he wanted to do something to raise awareness and funding. The group wanted to do something that would represent the challenges faced by cancer patients from the initial diagnosis and throughout the treatment. The Kokoda Trail was raised as a suggestion as it needs stamina, determination and courage to make the 96km journey to the Kokoda village. ‘We met up and started training for the trek. We were doing hikes in Galston Gorge, Berowa Heights National Park. We walked the Jerusalem Bay Track from Cowan to Brooklyn, part of the Great North Walk in Ku-ring-gai National Park. Before starting on the trek in earnest, the “Wish You Were Here” team visited the war cemetery outside Port Moresby, a cemetery with 3,300 soldiers buried in it. It wasn’t just the physical elements, the emotional impact of the trek affected the team as well. The team was aiming to complete the trek in 7 days, but the promise of warm food and cold beers at the end spurred them on to complete it in 6 and half. Following their trek, the team touched down in Sydney with one last goal – to celebrate life. The finale of the adventure was a Gala Dinner held in November. The Gala was in a massive old train maintenance building that had been converted to an exhibition hall at Australian Technology Park in Eveleigh, Sydney. More than 630 clients, business partners, friends and family came and experienced a wonderful night of entertainment and speeches. Ms Deni Hines and the Australian Girls Choir performed at the event and Peter FitzSimons, author of “Kokoda” and Ambassador for the “Wish You Were Here” team was a guest speaker. The Wish You Were Here team have raised over $220,000 for the Avner Foundation so far. Watch this space for Jim’s next adventure, and in the meantime, click here to lend your support to the Wish You Were Here GoFundraise.